Contract Law: Contracts are an integral part of any business, and an important part of commercial law. Contracts define what needs to be accomplished, and under what terms. And through non-compete contracts, employers can set terms with an employee regarding what can and cannot occur when he or she leaves the company. When entering into any contractual situation, it is important to have an experienced attorney to help protect your interests. 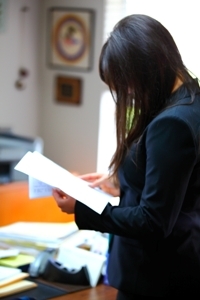 At the Law Offices of Setareh Mahmoodi, P.S., in Bothell, Washington, we provide sound advice and counsel for matters related to contracts and contract disputes. We can assist with drafting contracts and also analyzing existing contracts for potential litigation hazards. We understand the potential costs involved with contract revisions, and we also will work with you to determine if revisions made by the other side are make-or-break issues and act accordingly. If you are looking for Bellevue Contract lawyer, tax attorney, or an estate planning attorney feel free to contact our office for a complimentary initial phone consultation. You will always speak to an attorney and are able to ask questions and get some clarity on your individual case and needs. We can be reached at 425-806-1500.